Pavlo V’yalov was born in 1956, November, 24 in Ukraine. Education: Sevastopol Instrument-Making Institute – Mechanical Engineer. Kharkov Economics and Law Institute – Lawyer. In July, 1995 he was a first-hand participant in negotiations and signing of the Memorandum transferring the British Antarctic station “Faraday” (“Academician Vernadsky”) from Great Britain to Ukraine. In June, 1997 he founded and headed the International Charitable Fund for the Development of Man which during its existence has held hundreds of charitable events all over Ukraine. He is a co-founder of the all-Ukrainian boxing school “Stars of Ukraine”. The main task of the school is to support talented young people, revive the glory of Ukrainian sports, maintain sport schools and clubs, cultivate healthy life among children and youth. August, 1998 – decorated with the Order of Saint Stanislas for his considerable charitable activities. September, 1998 – appointed Grand Prior of the Order of St. Stanislas in Ukraine. 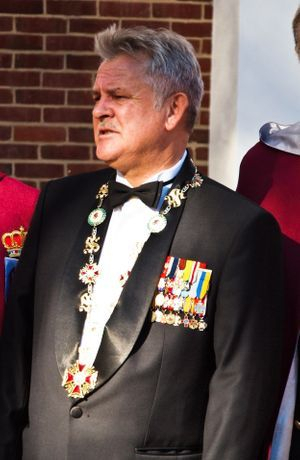 May, 2004 – elected Grand Master of the International Order of Saint Stanislas at an Assembly of Grand Priors of the Order of Saint Stanislas.